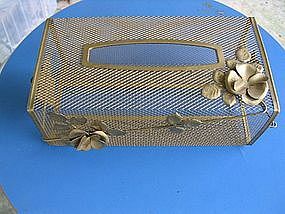 Brass mesh tissue holder which fits the larger box. There are small waste cans that match this holder. I haven't seen one in years, but keep your eyes open and you might find one. I did have one to match it, but somewhere over the years it has been lost. Need your zip code to calculate postage.